Set to kick-off next week in Azerbaijan's capital of Baku, a United Nations-backed Global Forum on Youth Policies will, for the first time, amplify voices passionate about developing and implementing national policies tailored to the specific needs, aspirations and demands of today's young people. Spotlighting the significance of this much-anticipated gathering, the Secretary-General's Envoy on Youth, Ahmad Alhendawi, in an interview with UN Radio earlier this week, said that with more young people getting involved in their future, it is time to re-examine how their Governments engage them. 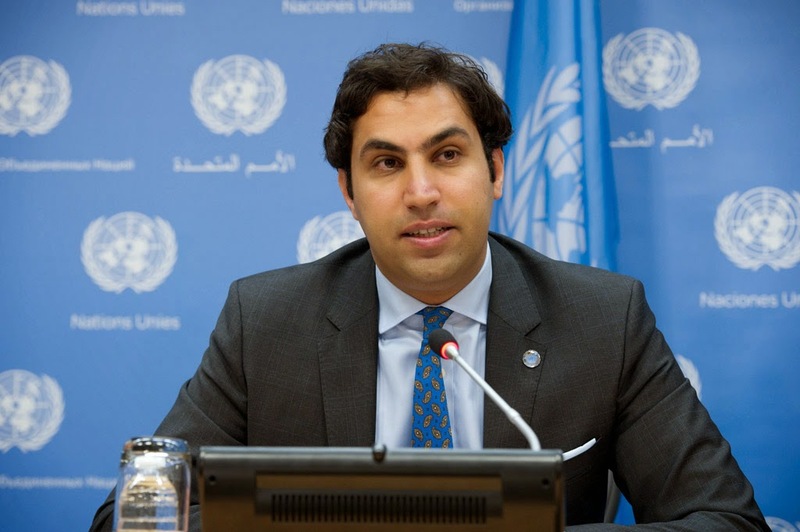 “This forum will represent, what I call, a unique opportunity for all policy actors to come together and discuss the situation of youth policy around the world today,” Mr. Alhendawi said. The Global Forum on Youth Policies will place in Baku between 28 and 30 October. Bringing together an expected 700 youth policy experts – from governments and parliaments, youth networks and movement, research and development communities – the gathering comes at an especially opportune time as young people face several dilemmas and challenges. Bringing together all these stakeholders will help properly examine how youth policy can be implemented in war zones, post-conflict settings, and even can tackle the issue of youth unemployment. Convened by Mr. Alhendawi's Office together with United Nations Development Programme (UNDP), the UN Educational, Scientific and Cultural organization (UNESCO), the Council of Europe and the Azerbaijan Ministry of Youth and Sport, the gathering coincides with the 20th anniversary of the adoption in 1995 by the UN General Assembly of a milestone document that set a global blueprint for national youth policies. The World Programme of Action on Youth, (WPAY) represents an overarching framework to regulate youth policy around the world, highlighting 15 priority areas ranging from employment and health to drug abuse and armed conflict. “[Over the past] 20 years, we have seen more commitment from Member States to implement a coordinated, holistic and comprehensive way of advancing youth development in their country,” Mr. Alhendawi said. Currently, of 198 countries worldwide, 122 have national youth policies in place – up from 99 in 2013. This upsurge signals that governments are increasingly aware of the need for legal and policy frameworks that respond adequately to young peoples' needs. Despite these advances, a number of challenges affect the efficiency and inclusiveness of youth policies, from fragmented responsibilities for youth issues and challenged youth participation structures to the lack of reliable knowledge and the absence of appropriate resources. “It's time now to reflect on the progress we have made in implementing youth policy, to talk about the quality criteria in designing and implementing national youth policy,” said the Envoy on Youth. Young people will also have their voices heard during the 3-day conference. Some 300 youth participants have been selected to attend the Forum based on their experience in developing and implementing youth policy. “We received some 5,000 applications [which] show great interest and commitment from young people on discussing youth policy,” Mr. Alhendawi said. “We looked to different backgrounds to ensure that we have a rich debate; especially the issues being discussed vary from education to employment, urbanization and other issues of interest to young people,” he added. In addition to revisiting the global blueprint for national youth policies set out by the World Programme of Action for Youth, the Forum aims to develop a common understanding of the needs for and rationales of systemic approaches to modern youth policy. There are high hopes that the Forum will also reinvigorate momentum and build quality criteria for implementing national youth policies and help Member States implement them.